Summer months mean longer days, outdoor picnics and home invaders in the form of termites and ants. A recent survey conducted in the United States revealed that nearly 25% of homeowners have had to deal with ant menace at some point or the other. Ants contaminate food and can also destroy wooden furniture. The easiest way to get rid of ants in the kitchen and other parts of the house is to plan a massive campaign against these pests. No one solution is effective in controlling ants and you must use an integrated approach to get rid of these critters. Starving the ants is the best way to get rid of them. Buy air-tight containers and store all food (especially sugar, grain and pet food) in them. Place all sealed containers at least 2” off the ground on shelves or inside cabinets. This will reduce your ant nuisance considerably. Many homeowners use pesticides and insecticides to kill ants. While this might give you fast results, you will unknowingly also harm humans and pets. So, at any cost, stay away from chemicals and pesticides to get rid of ants. Spring and fall months are the best time of the year to set ant traps. Gel based ant traps contain poison which kills ants by first infecting the workers who carry the poison back to the nest and kill other ants. Compared to spray pesticides, ant traps can be safely set where only ants can come in contact with them making them safe for use around pets and kids. Most ant traps available in the market contain arsenic. Avoid buying ant traps containing heavy doses of the poison which kill the ants instantly before they can carry it back to the nest. You will need to set the ant baits every few weeks to continue killing the ants. This is essential to get rid of ants permanently and prevent recurrence. Sanitation is an important step for long term ant control. Every evening, wipe down kitchen counters with vinegar and/or antiseptic cleaners. Store the leftover food in refrigerator or in sealed containers. Wipe away all crumbs from tables and floors. Educate kids to eat only at the dining table. Rinse dirty plates immediately. Vacuum the floors two to three times a week and add corn starch in the vacuum bags. This will cause the ants to swell up and die inside the vacuum bags. Avoid keeping pet food outside overnight as this invites ants and other insects. You can read more on easy ways to clean the house in this article here. This is an easy way to get rid of ants around the house. Ants usually enter your home from the garden outdoors. So make sure that you remove all sources of attraction from the outdoors. De-clutter the yard, clear away rotting wood, leaves and mulches and mow the lawn regularly. You can also trim branches and bushes and sprinkle beneficial nematodes solution to curb ant population. You can also create a protective barrier around the home by spraying insecticide around the walls. Make sure that the sprayed chemicals penetrate the soil and not just lie superficially on the ground. Keep pets and children away from treated areas. Sealing and caulking walls, floors and foundation can prevent ants from coming indoors. This will also reduce hiding places for the ants. 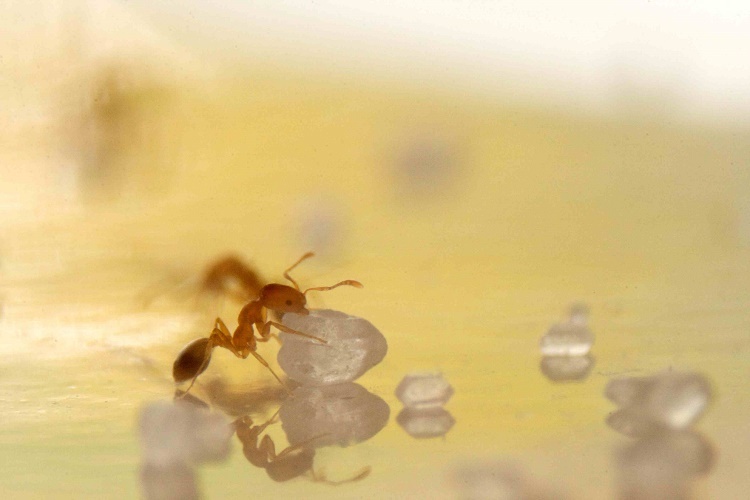 Sprinkling salt is an age-old remedy to get rid of ants quickly. Salt smothers the trails causing ants to disappear. If ants are running up your table, you can place its legs in dishes filled with water. This is an easy way to stop ants coming on your picnic table. Many herbs like dried sage mixed with black pepper powder is as effective as salt in getting rid of ant trails. Another easy and effective natural remedy for killing ants is placing bay leaves and whole cloves in holes where ants are found. Biodegradable laundry soap/detergent can be an effective solution to get rid of ants. Simply sprinkle the powder on ant trails or mix it with some water and make a spraying solution to use on ants. You can also mix soap with vinegar in 1:1 ratio and spread it in areas having ants. If you do not wish to use chemicals and pesticides around the house, you can sprinkle some cornmeal or cornstarch instead. This makes the ants thirsty and they go out in search of water. Many swell up due to water and die. Ant nests are usually found outside the home. Locating it will help you take action at the source and get rid of ants quickly. You can pour hot soapy boiling water down the ant nest. Do this at nighttime when most ants are back inside the nest. Use this remedy for 3 consecutive days to kill all ants. If your outdoor garden is causing your indoor ant problem, plant some ant-repellent herbs like catnip, pennyroyal, peppermint, spearmint and sage. This is an easy way to get rid of ants in the garden and your kitchen. You can also spread cedar mulch around the planted trees as it is a natural repellent. As stated above, ant infestation can recur after a few weeks if precautions are not taken. Add some sticky traps and glue baits in areas where ants have been seen. This will help you catch the infection early on before populations increase. Both powders consist of sharp molecular structures which shred the ants’ exoskeletons killing them from inside. Sprinkle these powders liberally in areas where ants are found to get rid of them instantly. Try these 15 easy ways to get rid of ants today!